If Mike D'Antoni exits LA, there's a whole list of names that would clamor for the job. With a month left in the NBA regular season, it’s almost that time. No, we’re not talkin’ about the playoffs. It seems as if every March, the madness surrounding coaches in this league begins to swell. 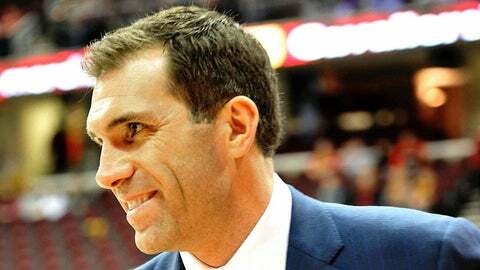 The primary questions: Who is coming, who is going, and is the person currently coaching the Los Angeles Lakers the right man for the job? We’ll get back to you on Mike D’Antoni, but in case he exits LA, there’s a whole list of names that would clamor for the job. Along with the Boston Celtics and New York Knicks, the Lakers possess tons of tradition and a passionate fan base. That job, while not available at the moment, is coveted by the brightest of coaching stars. As for everyone else, coaches who have jobs today should take comfort in the fact last year was a season of major change. Thirteen teams brought in new blood to lead their troops. That’s almost half the doggone league, kids. So perhaps we shouldn’t be fooled into thinking that last year’s firing bonanza will mean a quiet time. This is the NBA and it has no scruples. Just ask George Karl, formerly of the Denver Nuggets and last season’s coach of the year. That’s right, the coach of the year got canned. If there’s a place for an LOL in the NBA, that may be it. On the bright side, Karl is available. And yes, there are a few franchises that, sooner or later, will come calling. Former GM has no impact on what happens next with Cavs, despite what you may read. We don’t know those teams for sure (yet), but in this day of trying to create a splash, you can be sure several are getting ready to find their next-best thing. And by "thing," we mean "coach," because that’s basically how many are treated: Like objects with a game plan. So, who might be in trouble? Names that immediately come to mind are Mike Woodson of the New York Knicks, Mike Brown of the Cleveland Cavaliers and Larry Drew of the Milwaukee Bucks. 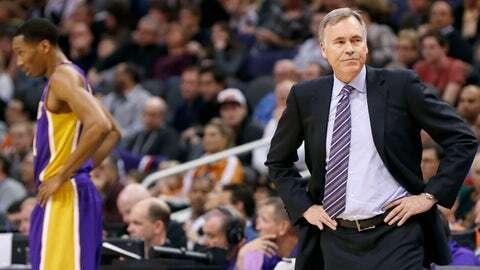 And, oh yeah, D’Antoni. How crazy is it to coach in the NBA? Brown and Drew are in their first seasons with their new teams — although Brown’s team isn’t really new, since he’s coached the Cavs before. And got fired. But other names are starting to emerge, as the postseason nears and the disappointments pile up. Rick Adelman of the Minnesota Timberwolves and Tyrone Corbin of the Utah Jazz reportedly should feel their seats getting a little warm. Although it should be noted that the Timberwolves still seem to believe in Adelman and the Jazz, plain and simple, don’t fire coaches. Anyway, maybe we should focus on the positive. Maybe we should think about the good men who could soon be gainfully (re)employed. If the Lakers and D’Antoni part ways, you just know Byron Scott will get (another) interview. Scott has coached the Brooklyn (then New Jersey) Nets, the New Orleans (then Hornets) Pelicans, and the Cavaliers (still in Cleveland and going by the same name). Scott also starred for the Showtime Lakers of the 1980s and works in their broadcasting department. Other names making the rounds, not specifically tied to the Lakers, include proven types such as Stan Van Gundy and Lionel Hollins, rising assistants Jerry Sichting (Phoenix Suns) and David Fizdale (Miami Heat) and college types such as Tom Izzo (Michigan State) and John Calipari (Kentucky). Also, one name brought up repeatedly as of late: Former Portland Trail Blazers coach Nate McMillan, currently an assistant with the Indiana Pacers. Of course, it’s all speculation at this point. But this is the NBA. It wouldn’t be real if coaches didn’t start worrying about their jobs in March. — Who has the best shot to reach the Finals out of the powerful Western Conference? An informal poll with NBA executives, scouts and a few coaches (conducted by Yours Truly) resulted in one resounding answer: The Houston Rockets. It seems as if Dwight Howard and James Harden have it figured out, and league insiders love that duo’s surrounding cast. "They have much better collective chemistry," coach Kevin McHale told the Houston Chronicle. "I think that is one of the most underrated things in sports — how well does everybody play with everybody? How well do they know their strengths and weaknesses?" — Reports that Phil Jackson is strongly leaning toward a front-office role with the Knicks are greatly exaggerated, sources with knowledge of Jackson’s thinking have told FOX Sports Ohio. Yahoo Sports also reported as much. But Jackson is expected to let the Knicks know one way or the other by the end of the week. — In case you’re wondering, former NBA coach Larry Brown is enjoying his role as the coach at SMU. Brown, 73, has the Mustangs on the brink of the NCAA tournament and led them to their first top-25 ranking in nearly 30 years. But if we know Brown, we know a return to the pros (in some capacity) is never out of the question. — The Knicks will operate their own NBA D-League franchise beginning next season in White Plains, N.Y. It will become the 18th D-League team, seven of which are directly affiliated with one NBA franchise. The team will conduct a vote to help choose a nickname.